211 Bernard: Of Racehorses and Kevin Chong... tonight! Of Racehorses and Kevin Chong... tonight! 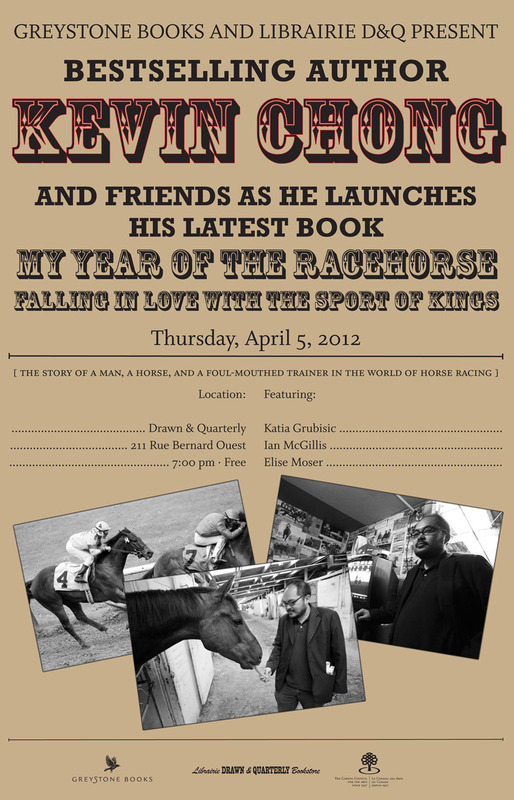 Join bestselling author Kevin Chong and literary friends Katia Grubisic, Ian McGillis and Elise Moser for the launch of his new book, My Year of the Racehorse: Falling in Love with the Sport of Kings. Written with keen observational humour, this story of a man, a horse, and a foul-mouthed trainer is strewn with fascinating tidbits and infused with the excitement and faded glamour of the horseracing world. Ultimately, it is the moving tale of a young man’s discovery that a meaningful life can arise from the most unexpected of circumstances. Kevin Chong is the author of four books, including Neil Young Nation – honoured as a book of the year by the Toronto Star, Globe & Mail, and Ottawa Citizen. He teaches creative writing at UBC. Tonight! Thursday April 5th at 7 pm at 211 Bernard O. Bring yr best horsey tales (ponytails? )!